It’s almost done. At last my workflow is seeing some organization and method in the madness. Following the birth of our son, I have lived in five different places in a span of one year. He was born in Mumbai, then we were off to my parents place for a few months, a few weeks with my in laws in Bangalore thereafter, then back to our old residence in Mumbai and then the big shift to our present residence. And all this when divinetaste was a new born baby too. This took a toll on my workflow and all my data was spread across different hard disks in a disorganized manner. I have been spending every free minute when I’m not tending to my baby organizing my workflow. And I made a pledge that I would not do anything else unless I finished this, so much so that the term “organizing my workflow” has become a light hearted banter between me and Ro. This would have happened earlier but right when I was in the middle of it, I travelled to my parents place for a much needed break which was forced on me. This meant that I had to finish the remainder of my work on my mac book pro and forgo the luxury of working with my iMac and that I have to sync the work done on my macbook with my main machine when I’m back. 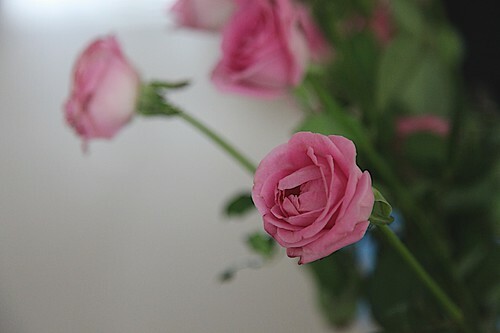 But, this also means a lot of other luxuries that a mother’s home affords. My mind is not at ease if any part of our home or my wardrobe is not in order. The disarrayed state of my pictures taken with so much of passion, energy and valuable time was continually weighing me down. So much so that I couldnt concentrate on anything until I sorted this out. 6925 images are now dumped in my trash bin. And there are more to follow. Yes! That’s the amount of junk I have accumulated down the road. Or blame it on the ease and convenience of digital photography where you go on clicking without thinking of the recurring costs of film. Whatever it is, I can now breathe easy since all my images are neatly grouped under relevant folders and projects with the appropriate keywords in my Aperture library and backed up too. And I now know where every image lives! And more importantly have access to every picture as and when I wish. I’m sure this will bring about significant changes in my workflow! 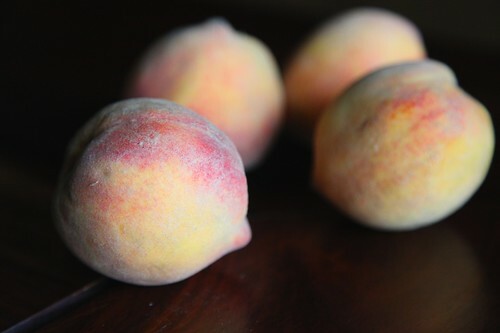 I have been indulging in Peaches a great deal this season. Eating them as is and I made this crumble twice and the Peach upside down cake twice too. I had been dreaming about making this cake for over a year. Ever since I saw it at fat free vegan. I modified the vegan recipe to suit my lacto-vegetarian taste and diet. What’s most appealing to me about this cake is its rustic charm. I often find myself wondering about cooking techniques and utensils in the olden days where home cooks and chefs didnt have access to all the high end modern tools and gadgets that we have today. I wanted to make this cake without any electric appliances and decided not to use my best friend while making cakes, my electric hand beater. The wire whisk became my assistant here to achieve the perfect cake batter. This cake is made in a cast iron skillet, giving it the perfect crumb, texture and an uncomplicated simple taste, setting it apart from cakes made in regular pans. 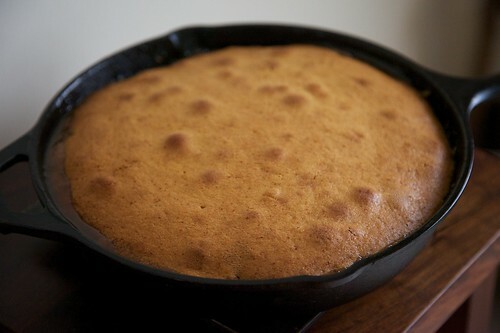 Having said that I would also say don’t sweat if you do want to make this cake and do not have a cast iron skillet. This could be made in a 9”round pan too. This cake is easily one of the best I have ever made in terms of taste. 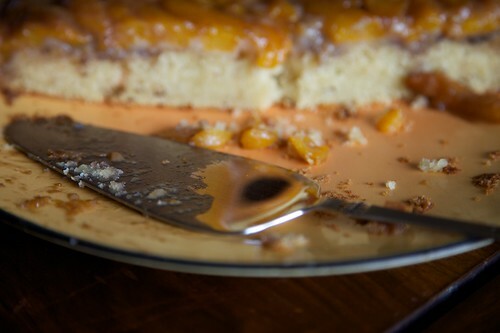 I couldnt stop drooling over the perfect golden brown crust set against a soft and spongy yellow cake with the goodness of Peaches in every bite. When I was about to spoon the batter over the Peaches, as an afterthought, I quickly stirred some ground cardamom seeds into the batter only to discover that Cardamom and Peach pair so well. The soft lusciousness of the Peaches sitting prettily on top along with the Cardamom scented and wonderfully crumbed cake makes this one a true delight to the senses. Although I would highly recommend making this cake in a cast iron skillet, if you dont have one you can use a 9” round cake pan. 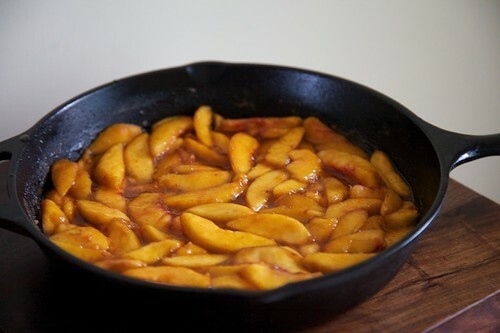 The Peaches can be substituted with Mangoes or Apricots. Sprinkle the 2 tbsp sugar over the peeled and sliced Peaches and keep aside. In a small bowl, mix all the liquid ingredients together and keep aside, allowing it to rest for a few minutes while the lime juice sours the milk. This will lead to a soft cake. In another bowl mix all the dry ingredients together and sieve once to make the mixture uniform and also incorporate some air. Another vital step for a soft eggless cake. Preheat the oven to 180 degree centigrade or 350 F.
Smear a 10” well seasoned cast iron skillet with oil, over the base and up the sides. This will prevent the cake from sticking to the pan. Heat the skillet over a moderate heat. Put in the brown sugar along with the water and stir until continuously until the sugar melts completely. Reduce the flame a bit and continue to cook until the sugar mixture is bubbly and slightly reduced. Be careful not to burn the sugar. Turn off the flame and place the prepared Peaches carefully over it. In a bowl beat the butter and the sugar with a whisk until soft and creamy. Stir in the cardamom powder. Pour in half of the soured milk and half of the flour mixture and beat well. Pour in the remaining milk and the flour and beat well until there are no lumps. Pour this batter over the Peaches and bake in the centre of the oven for 35 to 40 minutes or until a skewer inserted into the cake comes out clean. Allow the cake to rest inside the pan for 15 to 20 minutes and then invert it onto a large plate. Have you tried it with mangoes? I'm a little worried about baking with mangoes. I tried a mango bread once and wasn't a fan of what it turned out to be. Shaheen: Mangoes with firm flesh should work in an upside down as they are quite similar to Peaches in texture. I havent tried it as I'm not a big fan of mangoes in baking too. I might give this one a try when mangoes are in season, the next year. Hari Chandana and Nags: Thank you for your sweet words. Layers of peaches… hmmm… am already droollliiiinnnnnnnggggggg….. Babies are a delightful bundle but loads of work too, hope you have help. Anuradha : I do hope your sweet little daughter enjoys it. Nachiketa: Those are such nice and thoughtful words. I had no idea you lived in so many places this year. Glad to se your work flo and life are settling down. The peach dish looks lovely and I love the addition of cardamom. Delicious! Dear Anu, this cake looks so scrumptious. Do you think nectarines would work as well? Gayathri: Yes..you can try making this scrumptious cake with nectarines. a lot more attention. I'll probably be returning to read through more, thanks for the advice! Thank you so much for this awesome recipes. I share your love of peaches and as much as I love mangoes, this fruit just comes as a favorite when it comes to cakes, pastries, drinks and even jams ^.^ I was looking for someone who hjas actually used am egg less approach peach cake or a similar dessert and your recipe was the answer. I followed your recipe and the result has been wonderful. I think I'll keep on practicing to make it more perfect and then I'll share a pic of the result with you :). 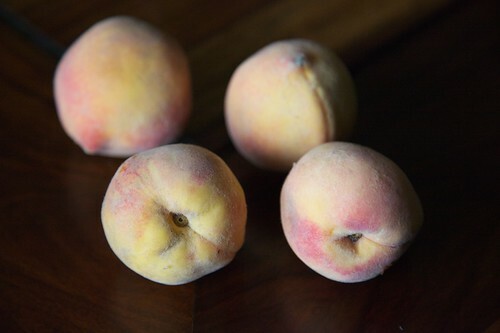 One question though – do you think we can somehow minimize the sourness of the peaches? Shuchi: Thanks for your kind words. The sourness of the peach can be balanced with sugar. is to not link back to those people who comment on your blog. Each of these bloggers have their own degree of success. always wait to see any new posts from you. Thank you very much for all your work. I am planning to make Eggless peach and cardamom cake. I don't see cardamom mentioned in the method. I am assuming that is it to be mixed with butter and sugar. Can you please confirm? Savita: I have made the required changes in the recipe. Thank you for pointing out the omission. 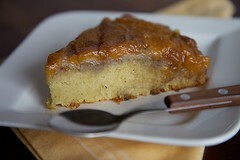 I am an ardent follower of your recipes and love this upside down cake. I'm wondering if I can use pears and some spice like cinnamon instead of peach and cardamom? What do you suggest? Vishakha- You can substitute it and if you do, let me know how it turned out! Made this cake , but make some changes as i dnt hav peaches used apples and sprinkled them with brown sugar nd cinnomn powder,second used whole wheat flr instead all purpose flr nd used cinnamon nd nutmeg powder insted cardmom and bravoooo my cake was absolutely soft,sponjy nd tasty,family liked it.